General Storefronts Inc., has developed a standard of safety throughout all operations of a project. It is our intention at GSI to initiate and maintain complete accident prevention and safety training programs. 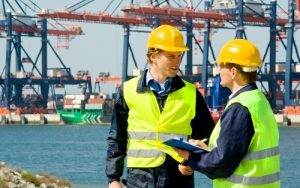 Every individual from top management to each and every craftsman is responsible for the safety and health of those persons in their charge, co-workers around them and themselves. By accepting mutual responsibility to operate safely, we all contribute to the well-being of all personnel. GSI will have an individual certified both in First Aid and CPR on the jobsite to ensure immediate and effective attention and assistance should an injury result. In case of an accident the first qualified first aid cardholder at the scene will take charge and direct the course of action. The emergency 911 number will be used for all serious injuries or fire emergency. At each tool trailer will be a phone list with emergency service numbers, including the County Sheriff, local Police, local Fire Department and the local hospitals. On GSI projects, when employees are ten feet or more above the ground, one of two systems will be used either fall restraint or fall arrest. GSI will provide fall restraint and fall arrest systems for employees involved in construction activities where fall danger exists. All operations involving fall potential will be evaluated to determine the best protective measures available. All foremen assigned duties requiring fall protection measures will hold training sessions prior to embarking on the job tasks. GSI’s entire crew is trained on ariel lifts, scissor lifts, and swing staging. GSI continues to strive to provide a safe working environment for all employees and personnel on our project sites and in the office. It is the employee’s responsibility as well as it is the company’s responsibility to be aware of safety hazards on the project and report any unsafe acts, conditions, or safety violations immediately. The word “quality” is a byproduct of the efforts we put into the project up front, as reflected by constant monitoring of the specifications of materials the architect has called out. We believe the essence of true quality control is in constant inspection, along with our teams having a deep knowledge of the job. Verifications and reminders are consistently communicated from upper management to our lead-men on site. In order to accomplish our expectations from our suppliers and field crew, we inspect their products and work on a regular and consistent basis, with corrections made well before punch list reviews.